I remember exactly where I was when I first heard about Papa Grows Funk. I was having a drink with a high school classmate at Train Bar in Roppongi in August 2002, my first visit to Japan, and he was telling me that our sixth grade science teacher, Mr. Allspach, had been a manager at the Maple Leaf Bar in our hometown New Orleans. As much as I hate adding to the narrative of New Orleans exceptionalism, perhaps this is unique and characteristic of the city: New Orleans is the kind of place where your middle school science teacher, known for daily quizzes, dapper suits from the ‘70s, and for being very tall and strict, can also be a regular at a neighborhood dive bar that hosts some of the best bands in the city. My friend said that Mr. Allspach recommended Papa Grows Funk and that they had a Japanese guitarist. I went to see them for the first time later that summer after I returned from Japan. It was a random Monday night in that dead space in the calendar when college students hadn’t returned to the city, but the bar was full. 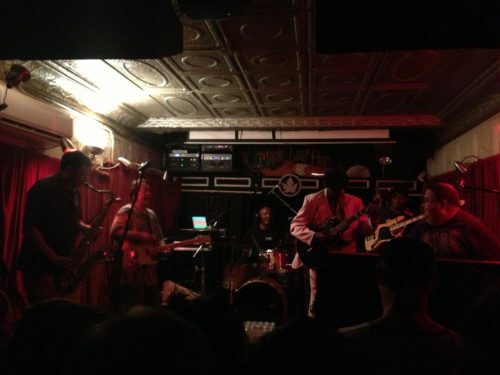 Papa Grows Funk at the Maple Leaf for their third-to-last show in April 2013. Walter “Wolfman” Washington on stage with them in this photo. I quickly became obsessed with the band and New Orleans funk, which all originates from the 1969 The Meters self-titled album (YouTube)(and probably some R&B that came before that). I even had a chance to see the band in Tokyo at Club Quattro in Shibuya when I was studying abroad in 2004. I spoke with him when I was back home in February. He’s super friendly and open and fits right in in New Orleans, where he’s lived since 1995. He’s managed the city that whole time without a driver’s license, which feels like a miracle, but it seems like he’s been based out of the Lower Garden District neighborhood since he got to New Orleans. We were sitting outside Mojo Coffee on Magazine Street, and he could point to the house where he first lived and the house where he recorded a solo album before he moved to the city. I need to give it a watch. This entry was posted in random and tagged june yamagishi, New Orleans, papa grows funk by Daniel. Bookmark the permalink.